This is wholesome nutritious dish. It’s a healthy breakfast recipe. Dals/Lentils are brimming with fiber, satisfying your hunger and reducing your appetite. This food is rich in soluble fiber, which also lowers blood cholesterol. Mixed dals gives plenty of energy as it is low GI and ensures consistent supply of energy throughout the day. Combine the soaked dals, rice and blend in a mixer into a smooth batter. Combine coconut, green chillies, ginger, cumin seeds, coriander and blend in a mixer/food processor into coarse paste. Add this paste to the previously ground batter, salt, asafoetida and mix well and the batter should neither be too thick nor thin. Fermentation not required but if you rest it at room temperature for 4-5hrs for nice, crispier dosas. Drizzle some oil and leave the dosa on medium high till golden brown, flip carefully and fry till golden and crisp. Repeat with remaining batter to make more dosas. Serve with any chutney/ pickle. 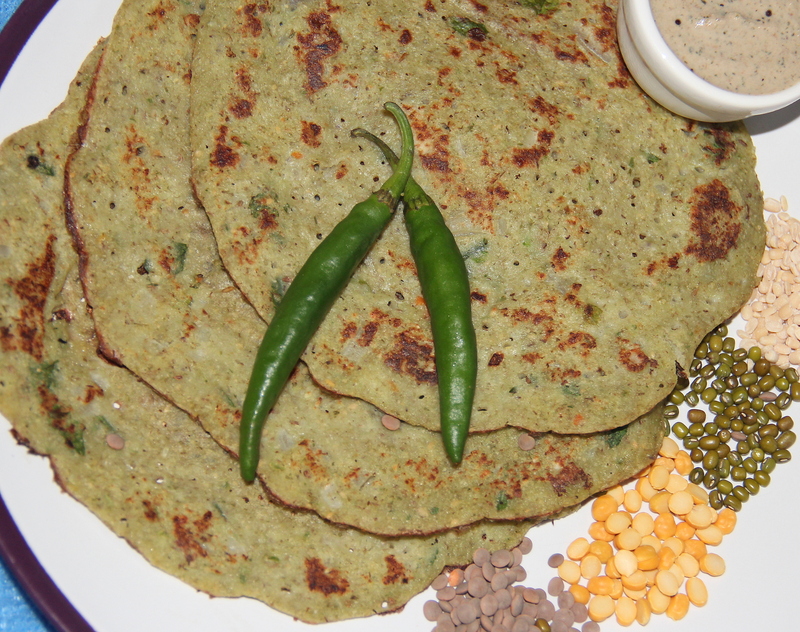 Posted on June 21, 2014, in Indian, Main dish and tagged Adai, Chitras healthy kitchen, Dosa, drchdietfood, Healthy crepes, Healthy dosa, Multi lentils dosa. Bookmark the permalink. 2 Comments. Presumably the batter can be left for several days for the fermented version. Does 4 or 5 days sound right to you? Yes it can be stored in Fridge for few days as long as the salt is not mixed. When using the batter salt can be added. Please don’t leave the unused batter in room tempturature for long. Hope this helps.